Dinesh D’Souza conspiracy theories: Conservatives blame the Obama administration for the bad news for Chris Christies, Bob McDonnell, and D’Souza. Christie, McDonnell, and now Dinesh D’Souza. Conservatives believe the Obama administration has declared a secret war on their heroes. The Dinesh D’Souza indictment started as an odd political story. Gerald Molen had no idea that his star was in trouble. 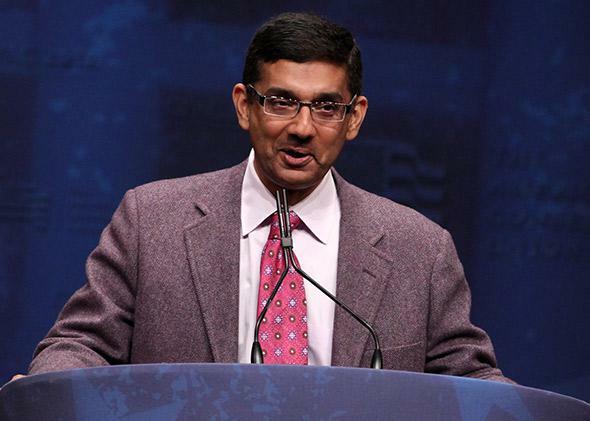 Dinesh D’Souza, the conservative author and—more recently—filmmaker, was arrested on Thursday, suspected of laundering “more than $10,000” in donations to a failed Republican U.S. Senate candidate by promising to reimburse friends who donated above the legal limit. Molen, the producer of D’Souza’s films, didn’t find out all of the allegations until Sunday. D’Souza, who’d been under investigation for months, hadn’t even talked to him. Malzberg moved on to a scarier story. Nineteen years ago, Molen had stood onstage to accept an Oscar for Schindler’s List. Since then, he’d helped release D’Souza’s 2016: Obama’s America. Since then, the IRS had admitted that Tea Party groups got intense scrutiny when they asked for tax-exempt status. Since then, the IRS had turned the magnifying glass on Friends of Abe, a group for conservatives in the entertainment industry that had also been looking for tax exemption. The pattern sketched itself. CBS initially cut Cruz’s theory out of the interview. The senator’s office threw the whole thing online. By Monday afternoon the Drudge Report was linking to Cruz’s truth-bomb, and the network was denying any bias in the edit room. D’Souza was tweeting it, beseeching readers to “watch Bob Schieffer’s reaction,” without specifying which body language would make the theory true. That thumping sound you hear is the long tail of the 2013 IRS scandal. It’s been eight months since the story broke, and subsequent investigations have found so little actual wrongdoing that House Republicans want the Department of Justice to probe the probes. Similar stories, like the NAACP’s worry that it was being targeted in 2004, have ended with similar fizzles. That’s the extreme position. The centrist position is that D’Souza’s troubles and the IRS scrutiny of Friends of Abe should be looked at on their own. Radio host Laura Ingraham, an author and occasional Fox News host, started her segment on D’Souza with a snippet of The Beatles’s classic stalking ballad, “I’ll Get You.” The record scratched: Ingraham told listeners that “we are criminalizing political dissent in the United States of America” and nobody would call it out. Do the D’Souza defenders have anything to say about the actual charges? Well, Ingraham made fun of how short the indictment was, and … that’s about it. Reporters who’ve actually compared the indictment to the timeline of donations and refunds to Long’s campaign say they match up neatly. Reuters’ Alison Frankel pointed out that campaign finance cases like this are common, and typically settled. The FBI saw an easy “straw donor” case. It pounced. But if you don’t accept that theory—if you see the shadow hand of a conspiracy—you’ve got so much to gain. Drudge, Cruz, Ingraham, and company lose absolutely nothing by speculating about an Obama administration hit job in easily shareable news stories and videos. Friends of Abe gets a sympathetic A1 story in the New York Times, one that silences—for now, at least—some internal debate about whether Republican politicians were taking advantage of the group, seeing their celebrity members as potential donors. And before we ask how D’Souza comes out of this, consider where he’s been. Back in 2012, around the time of the suspect donations, D’Souza resigned under duress from the presidency of King’s College. He’d scandalized the evangelical community after appearing at a conference with his fiancé, Denise Joseph, while not yet divorced from his wife. Denise Joseph happens to be the possible “straw donor” whose money was refunded by the Wendy Long campaign. What about his $33 million–grossing Obama movie? Ah, yes—about that. D’Souza’s documentary had all the impact on Barack Obama’s re-election that a horsefly has on a windshield. Before the election, when a Frank Luntz focus group of swing voters tested the effectiveness of some anti-Obama documentaries. “It tested poorly,” reported the New York Times. “Luntz warned his clients that it could undermine their cause.” Now D’Souza himself is the cause. Things are looking up.